We have many aerial lift rentals to choose from in Mocksville, including boom manlifts, self-propelled boom manlifts, scissor lifts, foyer lifts, roll around lifts and more. If you live in Mocksville, North Carolina and are considering a DIY project that involves high, hard-to-access areas, you may be wondering what the best way to reach those areas would be. Unfortunately, rocket shoes are only a thing of science fiction. However, you’ll be glad to know that there are a few actual options that exist for helping you reach even the tallest of areas. Two of these options are scaffolding and aerial lifts. Scaffolding is a great option if you are going to be doing something such as painting your house, where you will need to be in the same area for a few days at a time. 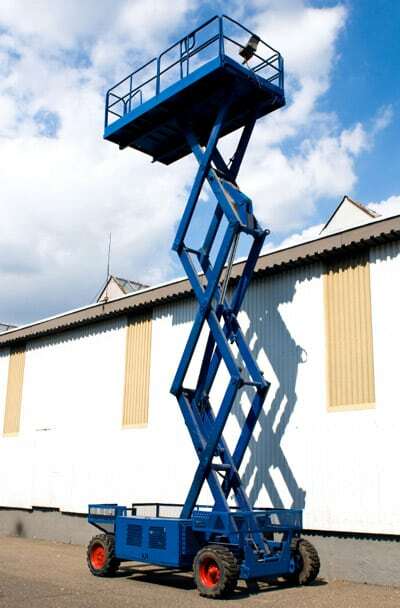 However, if you need something that will help you to reach those high areas, yet be mobile enough to move to several different areas in the same day, an aerial lift may be more practical. Aerial lifts are expensive and bulky, and for these reasons, it is highly unlikely that you will want to purchase one. Since this is the case, may we suggest that you turn to us for aerial lift rentals? This is an option that will be the most cost effective, while allowing you to have the equipment you need to complete an exceptional job. At Eagle Rentals, we specialize in renting out all sorts of tools and equipment that are necessary for completing any DIY task, including aerial lift rentals. Our highly trained technicians can listen to your description of the task that you are about to complete and assist you in finding the aerial lift that will best meet your needs. We have many aerial lift rentals to choose from, including boom manlifts, self-propelled boom manlifts, scissor lifts, foyer lifts, roll around lifts and more. Your safety is important to us, which is why we thoroughly inspect, test and service all of our aerial lifts before we rent them to you. We know what to look for and are able to ensure that the equipment will work properly for you. When you choose to rent from us, we can help you to get your job finished quicker and easier. Turn to us for all of your aerial lift rental needs in Mocksville. At Eagle Rentals, we offer affordable aerial lift rentals to residents of Mocksville, Statesville, Troutman, Denver and Mooresville, North Carolina.